Hope you’re in hot pursuit of excellence on this gift of a day (you’ll only get this day once in your entire lifetime so I encourage you to use it well). The reality is the great achievers + game-changers just did DIFFERENT (and seemingly strange) things. 1. Know what you want. Clarity is power. And vague goals promote vague results. 2. Remember that every problem has a solution. Maybe you just can’t see it. Yet. 3. In this Age of Dramatic Distraction, the performer who focuses the best wins the most. 4. Before someone will help you, you need to help them. 5. Become the most passionate person you know. It’ll be contagious. 6. Know more about your craft/the work you do than anyone who has ever done the work you do…in the history of the world. 7. Join The 5 am Club. Your most valuable hours are 5am-8 am. They have the least interruptions. 8. Devote yourself to learning something new about your field of mastery every day. 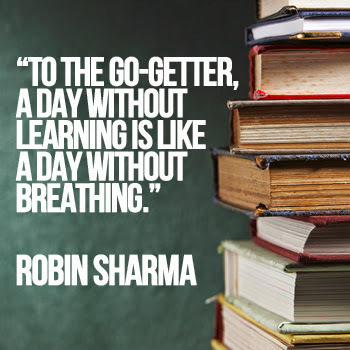 Success belongs to the relentless learners. Because as you know more, you can achieve more. 9. Remember that when you transform your fitness, you’ll transform your business. 10. Don’t check your mobile when you’re meeting with another person. It’s rude. And rude people don’t reach world-class. 11. Every time you do what scares you, you take back the power that you gave to the thing that scared you. And so you become more powerful. 12. A problem is only a problem if you make the choice to see it as a problem. 13. Stop being a victim. Your business and personal life was made by you. No one else is responsible. To make it better, make better choices. And new decisions. 14. You can lead without a title. Don’t wait to get a position to stand for excellence, peak quality and over delivery on every expectation. 15. Find your own style. Be an original. Every superstar differentiated themselves from The Herd. And marched to their own drumbeat. 16. Understand that when you play small with your success, you betray your potential. And the birthright you were born under. 17. Eat less food and you’ll get more done. 18. As you become more successful, stay really really hungry. Nothing fails like success. Because when you’re successful, it’s easy to stop out learning+ out Over Delivering +out thinking and out executing everyone around you. (Success is Beautiful. And dangerous). 19. If you’re not over prepared, you’re under prepared. 20. The only level of great manners to play at is “Exceedingly Polite”. In our world, this alone will make you a standout. And differentiate you in your marketplace. 21. Remember that the moment you think you’re a Master, you lose your Mastery. And the minute you think you know everything, you know nothing. 22. To double your results, double your level of execution. 23. Invest in your personal and professional development. All superstars do. 24. Get this year’s best Targets of Opportunity down onto a 1 Page Plan. Then review it every morning while the rest of the world sleeps. 25. You don’t get lucky. You create lucky. 26. When you push through a difficult project, you don’t get to the other side. You reach The Next Level. 27. Smile. And remember to inform your face. 28. Spend time in solitude every day. Your best ideas live there. 29. Debrief on how you lived out your day every night in a journal. This will not only record your personal history, it will make you uber-clear on what you’re doing right and what needs to be improved. 30. If you’re not being criticized a lot, you’re not doing very much. Ridicule is the price of ambition. 31. Develop a monomaniacal focus on just a few things. The secret to productivity is simplicity. 32. To get the results very few people have, be strong enough to do what very few people are willing to do. 33. Rest. Recover. It’ll make you stronger. 34. Buy a smaller TV and build a larger library. 35. Remember that the bigger the goal, the stronger a person you must become to achieve that goal. So goal-achieving is a superb practice for character-building. 36. Food fuels your body. Learning feeds your mind. 37. Don’t ask for respect. Earn it. 38. Finish what you start. And always end strong. 40. In business, don’t play to survive. Play to win. 41. Protect your good name. It’s your best asset. 42. Remember that words have power. Use the language of leadership versus the vocabulary of a victim. 43. Give more than you take. The marketplace rewards generosity. 44. Know that if it’s not messy, you’re not making progress. 45. Be a hero to a kid. 46. In business, aim for iconic. Go for legendary. Make history by how awesome you are at what you do. 47. Please don’t confuse activity with productivity. Many many people are simply busy being busy. 48. Your doubts are liars. Your fears are traitors. Stop buying the goods they are attempting to sell you. 49. The best anti-aging remedy in the world is working really hard. 50. World-Class performers have no plan B. Failure just isn’t an option. 51. You have the power to change the world–one brave act and one person at a time. Please use it. The Lessons are from Robin Sharma. Up for grabs Over 500 books on Wealth Creation, Internet Marketing and Network Marketing. Call 07033875827 to lock down your slot. Are you interested in making extra passive and active income? Sign up to receive email alerts of Emmanuel Oluwadunsin Ayeni's latest articles from EzineArticles.com!